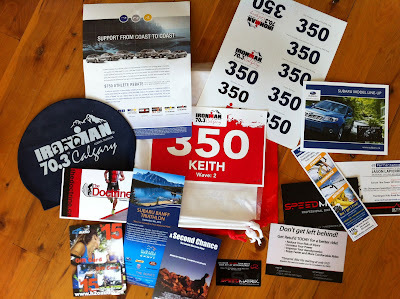 The Calgary 70.3 is this weekend, and I'm not in it anymore. They put a bright red wristband on me and said I had to keep it on till after I get my bike after the race. I just cut it off a few minutes ago. At package pickup I told the chip guys I wasn't going to be starting, so they didn't have to wonder about chip 350. I've said it here, and on Facebook, but it was hard to say "I'm not racing" to the chip guys. It would be a dumb thing to do, even though my back is feeling much better. Maybe next year. Or maybe not. Right at the moment I'm feeling really ambivalent about this racing thing. Maybe it's just feeling sad that I have to miss this race. I'm planning to take the cow bells and go cheer, but it's not the same. Here's a picture of the expensive free swag. That's it. The expo was a pretty quiet affair, and I didn't buy anything. The cycling jacket was the closest thing, and I didn't feel like spending $100 on that. The afternoon was spent on a patio drinking beer with my buddy SD. I happened to see Sara Gross there, and said hi and hoped she would have a good race. I don't often do this, drink beer on a patio on a summer day, and it was really nice. Once home I headed out for a run. Yes, really. I did a bit of limbering up, and walked briskly for a few minutes, then started running easy. It felt really good! My stride felt good, and my back/core/hips did not hurt in the slightest. In fact this run was the least painful thing I've done for the last 3 weeks or so. Towards the end of the 30 minute run it was getting a bit choppy, and there were a couple niggles in my heel, and knee, but nothing out of the ordinary. I just ran easy and tried to keep my posture good. Afterward I did a good stretch, pigeon for a timed 5 minutes a side, and other stuff. I've been tagged by The Blonde, so I need to read up on my fellow tagees and figure out what I want to write. It says I need to come up with 7 random things. I'm just assuming it can't be any of the 44 random things that I've already done in previous blog taggings. See here, and here. And I have to think about who to tag. Hmmm. (Rubs hands, chuckles evilly.) Maybe Saturday, if I don't get sidetrack with lawn manicuring. When I read your blog title, I started wondering if you got something I didn't. Yeah, it's a pretty pathetic package. At the very least, they could have thrown in a couple Gu's and a bonk breaker. I am curious to see what the finishers shirt looks like. Out of the entire package I kept the transition bags, (always useful for something), the bike fit stuff, the H2Audio gift card (though I'm unlikely to use it), a blurb about the Banff Tri, (which I've discovered is a scheduling conflict for us, though maybe next year and do the series), and the Human Kinetics blurb. What did you keep? happen is if I'm sensible now. BTW, you've got some lovely photos on your blog too. Do you take pics while you run? Hi Jan! Thanks for dropping in and commenting. I sometimes take pics when running, or biking, or just shambling around. Not while I'm swimming though, you have to visit Bree Wee for that.